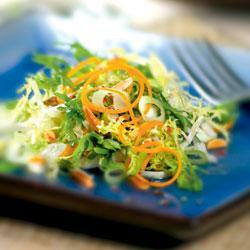 In large bowl toss together frisee, cabbage, carrot, onion and cilantro. In small bowl whisk together oils, lime juice, soy sauce and sugar. Add freshly ground black pepper to taste. Pour dressing over slaw; toss to coat. Add almonds, toss again and serve.